It is that time of year - the days are shorter and darker, our weekends are taken up by family get togethers and Christmas events, and the temptation to overindulge on holiday treats is almost ever present. It’s a stressful time of year for a lot of people, so we wanted to share 5 tips to help you keep your sanity, avoid the post-holiday guilt, and help you to make it through the next few weeks. 1. Set your boundaries and remember to put your own health as a priority. This is so important and why we put it first on the list. There is a lot of pressure over the holidays to participate in family functions, work events, or other types of social gatherings. It is so crucial to remember that you always have the power to set your boundaries and say no! If something causes you a lot of discomfort, anxiety or feels more like an obligation rather than something that you enjoy, it is perfectly okay to politely decline an invite or to say no without giving a reason. 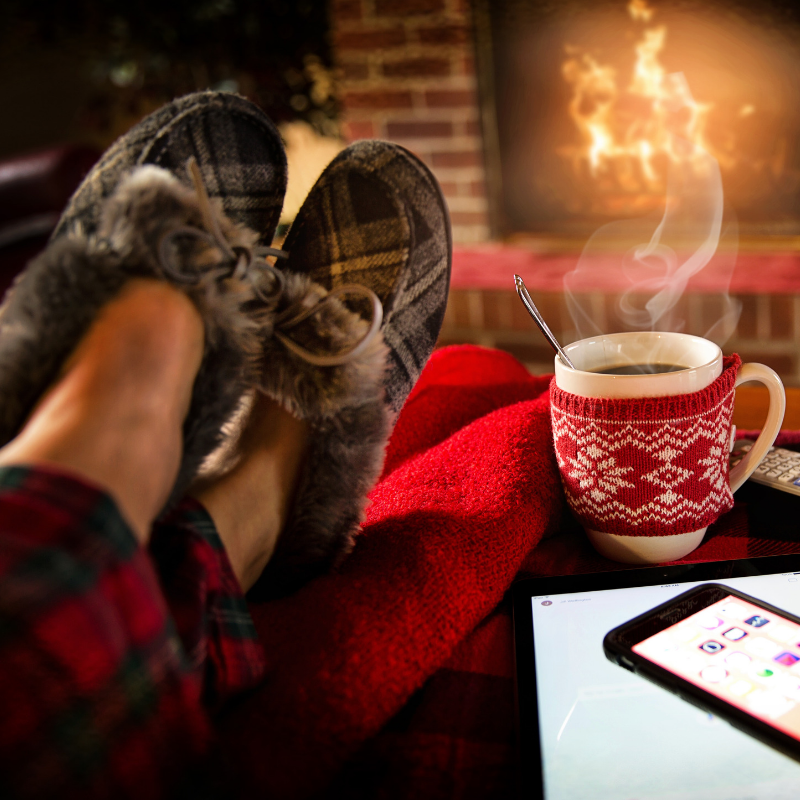 Depending on who is hosting the event and your relationship with them, you can even be honest and let them know that you appreciate the gesture and their desire to include you, but you are taking steps to make sure you are managing your stress over the holiday season which means limiting the amount of events you commit yourself to. Maybe even suggest a post-holiday get together instead, when things aren’t so busy. If the person cares about you and your well-being, they will understand and appreciate your honesty. So often we let ourselves slip to the bottom of the priority list during the holidays and it is so important to stay as consistent as possible and put yourself first! Your sanity and well being matters, so say no! :) And feel good about doing it. This also means, don’t let your routine or habits completely fall off the wagon! Keep getting out to class, doing your yoga, taking your supplements, and moving your body. While it is okay to have days off, don’t think of the holiday season as a write off. It makes it so much harder to get back on track in January. Instead, make a plan and stick to it! If you have trouble, don’t be afraid to reach out to a coach - that is what we are here for! We can help you find a balance and create a personalized strategy of helping you continue to make progress in your goals, even when life gets a bit more chaotic. When we are tired, we are more susceptible to feeling stressed, making food choices that may not make us feel great, and frankly - feeling crabby and moody! Holiday parties and family get togethers often mean late nights, so try to manage this as best as you can by planning ahead. Before leaving for an event, plan your exit time and try to stick with it, even if you feel pressured to say later (set those boundaries!). Aim for 7-9 hours of sleep every night and you your body will thank you! 3. Avoid late night snacks. This tip goes hand and hand with #2 - avoid eating and drinking late at night! Research has shown that hunger is perceived to be stronger in the evening, and stress hormones exacerbate the intensity of these cravings…. meaning you may not actually be hungry even though you are feeling the need to binge! Research also shows that our bodies benefit from a period of fasting overnight, because then our body can focus on healing itself when we sleep and regenerating cells rather than digesting the food we ate. So, once again, plan ahead and set a cut off time that allows you to get between 8 and 15 hours of fasting and you will feel so much better in the morning - in so many ways! Seriously - a little bit of planning can go a long way and will help set you up for a successful, stress-free, happy holiday season! 4. Be conscious and choose your indulgences wisely! Don’t eat something just because its there. Just because a coworker brought something in, or you are looking at a table filled with goodies doesn’t mean you have to indulge in everything! We aren’t telling you to avoid it all, but just choose wisely. Ask yourself if it is something you really want and will enjoy, or is it just tempting because its there? I jokingly call this the “waste of calories” line of thought. If there is a treat that you know you absolutely love, then yes - go ahead and indulge. Enjoy it and savor that moment! That is what life is all about and you don’t want to feel overly deprived. But, if its a cheap sugary treat that you don’t even really like that much - then don’t waste the calories! Save it for the good stuff and you will feel way more satisfied (and less of the guilt!). 5. Drink lots of water and be mindful of sugary drinks! There are many holiday cocktails and beverages that are very high in sugar: eggnog, hot chocolate, alcohols and liqueurs, artificial fruit juices, etc. Liquids can be a sneaky source of calories that are often consumed quickly, without a lot of thought. of hunger, stress and make you feel not so great - especially the for the morning after. Try enjoying a glass of water before and after each alcoholic beverage at a party, or use a smaller glass size and limit the number that you have. It may also help to take magnesium, vitamin B and/or C supplements before bed, which helps the body to metabolize the alcohol. What are some of the ways that you use to reduce stress over the holiday season? Of course - if you need us, we are always here for you so don’t be afraid to reach out. We truly hope you have a wonderful holiday season, filled with family, friends and lots of joy.